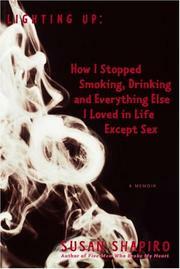 A keen, revved-up account of dropping addictions, from the author of Five Men Who Broke My Heart (2003). After smoking for 27 years, Shapiro decided the time had come to make a break with cigarettes. She needed help from many quarters to do this, and her own intelligence and willpower were crucial tools, but here she concentrates on the work she did with her psychotherapist, Dr. Winters. Shedding her addictions one by one left her feeling like a burn victim—even the air around her was excruciating—but she and Winters, two sharp, sophisticated, straight-shooting cookies, worked well together. No enormous surprises resulted from their excursions into the sources of her hungry hedonism, which included a desire to stifle her emotions, an inability to let herself feel bad, a gap in the childhood-love department. More unusual were the little adages (“lead the least secretive life you can,” etc.) that Winters penned on the back of his business cards and gave her after each session. As Shapiro gathered herself, she witnessed the collapse of several friends, whose descents were especially terrible when underscored by her own miseries (anger, tension, bloating). On the road to recovery, she removed not only cigarettes from her life but also alcohol, chewing gum, bread, and marijuana, each punishing loss providing her with its own addictive smoke screen. Although both ramped and focused in her prose, Shapiro can’t entirely avoid such mantras of recovery as: “There is only one way for an addict to feel happiness, and that’s by using,” or “Underlying every substance problem I have ever seen is a deep depression that feels unbearable.” Yet she gives these nostrums clarity by demonstrating just how they pertain to her circumstances; along the way, her razor-sharp sense of humor provides balance and perspective. The manic energy Shapiro brings to her life instills her memoir with a theatrical freshness.